UNCW Curriculum Materials Center staff and the Isaac Bear and Wilmington Early College High Schools are working together to help Robeson County students affected by Hurricane Matthew. Organizers are planning a series of drives throughout the academic year to assist students enrolled in West Lumberton Elementary School and Lumberton Junior High School. For the December drive, the group is collecting new scarves, hats and gloves along with new or gently used coats and 18-gallon storage totes through Dec. 16. During the storm, hundreds of Robeson County residents were rescued by swift boats, helicopter, military vehicles and small boats. 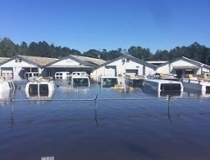 Approximately 2,000 residents were housed in shelters and an estimated 7,000 structures were damaged by raging storm waters including the Public Schools of Robeson County administrative offices, West Lumberton Elementary School and W.H. Knuckles Elementary School. West Lumberton students are attending classes at the Lumberton Junior High School until repairs are completed at their school. “Oftentimes, relief efforts dwindle as the news stories fade away. We’re hoping to coordinate numerous efforts to help our Lumberton peers because we care very much about them and will continue to encourage them as they work to recover,” Batten said. Drop boxes will be available at the Curriculum Materials Center, room 127 in the Watson College of Education and at the Wilmington Early College High School, located at 4500 Blue Clay Road in Castle Hayne. Individuals can also send holiday cards to students and Robeson County employees. Blank cards will be available at each drop box site. Organizations, groups and churches interested in participating in the drive can email Batten at batten@uncw.edu to schedule a pick-up time.